Features: Hand-held ultraviolet lamp, ideal for detection of skin disorders. Powered by 4 x .. This comprehensive dermatology instrument pack offers the widest selection of instruments for all..
Dermatology Oil 6 x 10ml Bottles ..
Dermatoscopy Oil 12.5ml 4 Glass Bottles ..
DermLite II Pro HR is the world’s brightest pocket dermatoscope that you can attach to a camera r..
Dermlite Lumio is the ideal device for general skin examinations where an in-depth, glare-free im.. The original dermatoscope, Delta 10, has evolved. Heine are very happy to introduce th.. Features: Sterile. Stainless steel cutting edge for soft or weak tissue. Ribbed .. 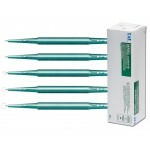 Features: Sterile Stainless steel cutting edge for soft or weak tissue. Ribbed h.. The ri-derma® dermatoscope offers general physicians and specialists a reliable method of dermato..
Ri-derma Contact Plate With Scaling 0-10mm Non reflecting and highly transparent contact ..
Ri-derma Contact Plate Without Scaling Non reflecting and highly transparent contact plat.. Skin Scraping Envelopes x 25 .. The unique design and consistent sharpness of these instruments enables routine curettage ..